OK, so the title I'm focusing on in today's "12 import games I bought in 2012 but didn't tell you about until now" post isn't as thrilling as the one I wrote about yesterday--or at least I don't think it's as thrilling. Still, it's an import, and a fairly odd one at that (thanks to it being a soccer-based RPG), so at least it's not a total loss. Would you believe that I've yet to spend much quality time with this pick-up? Yeah, I thought you would--especially given the track record suggested by the majority of my "Acquisition #123" posts. Actually, I'm kind of amazed it's even been unwrapped, as I honestly don't remember playing it at all since it arrived on my doorstep a number of months ago. 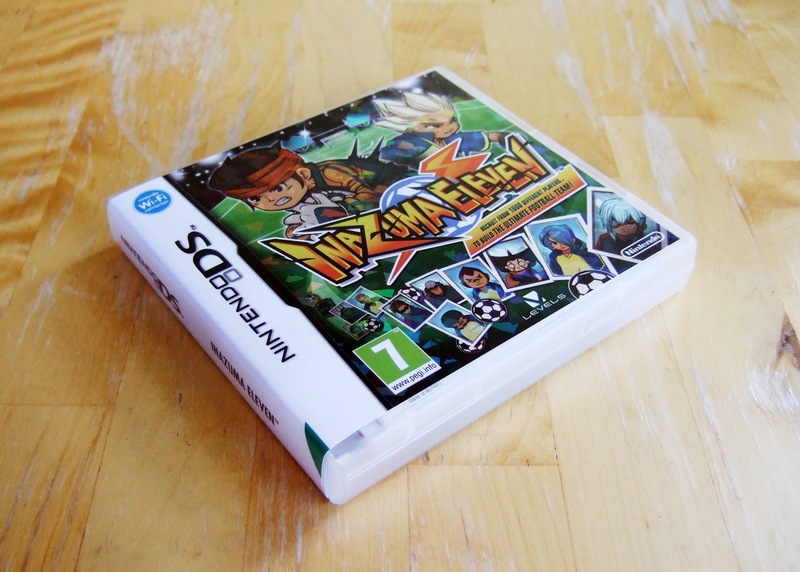 I guess I should have included Inazuma Eleven in one of those silly posts--like "Five games I have to get back to (and hopefully finish) in 2013" or "Five games I have to rip from their shrink-wrap and actually play in 2013"--I published last week, eh? I'm curious about Inazuma...percentage-wise, how much is soccer? Me, too, Justin! I'll find out soon, I promise. I have a feeling there's a lot of soccer in it, by the way, which is the main reason I've yet to play it, to be honest. (I'm not much of a soccer fan.) Anyway, I'll let you know! I was pretty excited for Inazuma Eleven back when the first one came out, because 1) Level 5, 2) RPG, and 3) the uniqueness of the whole concept. And I was super pissed that they refused to let US get a taste of it, especially considering out successful it was. So when DS emulation became a thing, naturally this was one of the first roms I picked up. I must admit that I only played a few minutes before being completely underwhelmed by the whole thing and turning it off. I didn't even get to see what the soccer matches are like. It felt like one of those Pokemon or Yu-gi-oh clones that's aimed squarely at kids, and the fact that it has an anime to go along with it only reinforces that. And I've never heard anyone say that they really enjoyed playing it, even tho it always made those lists of "games that need to come to the US". So if you ever do play it some more, I'd love to hear what you think. Oh, I'll definitely play it at some point, Steve. And I've heard people say they enjoyed playing it--although, to be sure, most of them can be found in the game's official thread over on NeoGAF. Anyway, I'll be sure to share some impressions (and, eventually, a review) of the game after I've finally sunk my teeth into it, OK? Ha! Usually I don't, Lizzi. I was more interested in this one because it's an RPG. I'm guessing you haven't played it? Do you tend to like soccer games, by the way, or not? No not really. I don't really like sports-games in general. I think it's more effective to make sports in reality to have fun than just playing it. Like all the ski, soccer and basketball-games. The sense escapes me. But if you say this one is more an RPG then this could be an exception. You don't think some older games offer the same magic that more contemporary ones do? I sure think they do! Hmm I think that's hard to say. I think it's a different kind of magic. The great storylines and gameplay the producer came up with to make up for the graphics which fascinate the player. Today the great graphics are able to captivate the people. I guess this is a case of "different strokes for different folks," as I personally think graphics have always been able to captivate people--even as far back as the Famicom (see games like Duck Tales and Little Nemo). I agree that they're more able to do so today, but I wouldn't say it's solely a modern phenomenon. Or the graphics of the N64 for example (ok maybe I'm the only one who thinks this way but...). The graphic-style were awful! (in my opinion). I know... first time nintendo had 3D graphics but still... I don't want to say the games were bad! I love many of the NES, SNES and N64 games or PS1 and stuff. And I loved the stories. I'm kinda with Lizzi on this one - sports game/theme, pass hehe. No matter that it is an RPG. I remember in FFX with Blitz Ball. I did the barely required minimum to get past it. Absolutely hated the mini game and didn't bother doing the special Blitz Ball game to get Wakka's upgrade. Oh, I don't mind that you two hate sports games. I do, too, for the most part--unless we're talking about tennis or golf games.